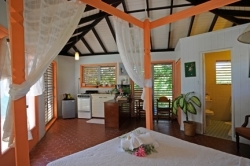 Explore the tranquil white sand beach and turquoise waters of Fischer’s Cove Beach Hotel. Choose between beachfront cottages, hotels studios or hotel suites, all flawlessly decorated to depict the atmosphere of the authentic Caribbean. Savor exotic Caribbean dining at the water’s edge with the on-site restaurant. 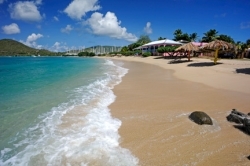 Spend the days relaxing on our private beaches, hiking among the boulders, or snorkeling at the world famous “Baths”. 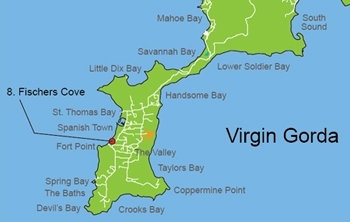 Whatever you decide to do, Fischer’s Cove will be waiting to welcome you home with open arms. Lovely family run small hotel with excellent very popular restaurant onsite. 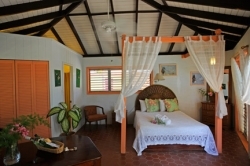 An authentic Caribbean experience featuring comfortable hotel rooms, and beachfront cottages. Restaurants features traditional West Indian delicacies. Enjoy the bar, the lounge, the library, WiFi access, ocean views and legendary sunsets. 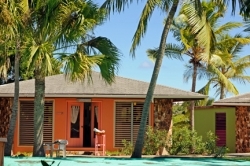 in the heart of Spanish Town, yet right on the tranquil beach on the Sir Frances Drake Channel.